Now you need to figure out where to dig the holes to place the posts that will support your deck. The string line you set up is 2’0” to the outside of the deck all around. Your string rectangle should measure 12’0” x 24’0”. The number of posts to be used in supporting your deck is directly affected by the size of your deck and/or the complexity of your deck. This deck is simple. The joist (the parallel framing that supports the decking) selected, (2x10), will span the 10’0” distance without any intermediary support. Section 4 Deck Structure goes into more detail on supporting structures. There are no posts needed up against the house because of the ledger board (anchors one end of the joists) bolted to the house (Section4 Deck Structure). A 2x10 cannot span 20’0” without an in-between support; therefore three posts will be necessary for this deck. The names and functions of all of these parts and pieces are explained in Section4 Deck Structure. One will be located near each corner away from the house and the third centered between the first two. This deck will have a 2’0” overhang (called a cantilever). Measure away from the house 8’0” and drive a temporary stake along both sides of your deck. Run another string line between the two stakes. Measure in towards the center from your string line 2’6” from both ends and mark those points. Find the center point and put in another stake. Now you have the locations of all three posts. Up until now, your level of exertion and effort has been minimal. Unless you are use to hard physical labor, you might want to pay attention to the little aches and pains you will feel building the rest of your deck. Stop when you feel a twinge somewhere. Don’t ignore it. It means you’ve strained or overexerted something and if you continue, it may lead to something more serious. Use your legs for lifting, not your back. Shoveling counts as lifting. Remember how you felt after shoveling snow last winter? Don’t struggle to lift something, get help. Barn raisings were a party, in a sense, just as much as they were work. Many people make heavy work easier and get the job done quicker. If you think you are sweating a lot, you’re probably right. Stop and rest before you succumb to a heat stroke. You should drink lots of water as you work (not Gatorade, etc). Take lots of short breaks. You may get muscle aches in muscles you forgot you had (or don’t realize you have). Be careful as you work through the pain so you don’t get hurt any worse. The muscle pain does go away after a couple of days. Your muscles adapt quickly to increased usage. Don’t continue to work if you’re tired or if it’s late in the day. 100% of your mind as well as your body needs to pay attention to the task at hand. If you lose your concentration, or if you’re trying to work in the dim light of dusk, you’re asking for an accident to happen. The hole for the post should be twice the size of the post itself. If you are using 4x4’s, then the hole needs to be 8” in diameter. Don’t get fanatical trying to make it perfect. A 12” diameter hole is used for 6x6’s. This simple deck and the moderate usage of it needs only be supported by 4x4’s. Our deck has no basement access beneath it, so it will only be 4’0” off the ground. This house has a crawlspace. The hardest way to dig out these three holes is with a shovel, because the sides of the holes should be relatively vertical. The next option is to use a post-hole digger. It’s sort of like a 5’0” long salad tong and requires a lot of upper body strength. The fastest and easiest way to dig holes is with an auger drill. This is the same gadget the phone company uses to plant telephone poles. It can be rented and used by one person. The next aspect is how deep to make these holes. Okay, the first consideration is the frost line in your area. In the dead of winter, if you have one, how far down does the earth freeze? In the Middle Atlantic States, this is 30”. The Building Code authority in your area can provide this information. At the very least, dig down 24”. Otherwise, dig down 6” below the frost line. This will prevent the heaving and settling of the earth which will have a profound impact on your deck eventually. It is prevented because the post is on solid ground not normally subject to the freezing and thawing environment (earthquakes are the exception). The “profound impact” mentioned may be the sound of your deck being literally ripped away from your house and maybe damaging the foundation as well. The next consideration is the consistency of the soil in your area (mentioned in Section 1. Deck size, location and shape). Sandy or rocky soil is more porous and can hold more water. Soil full of clay tends to keep water at or near the surface. Rocky soil or clay earth tends to keep water at or near the surface. There are two ways to anchor your posts in place. They can be anchored to the top of your cement piling (also called a “footing”) or embedded in it. What it comes down to is a personal preference. Dig the three holes and install the posts all at the same time. For the top mount, fill the hole with concrete a few inches above ground level (no more than six, unless there is an extreme slope involved). Use a sonotube (cardboard tube like the center of toilet paper but way, way bigger). By the way, that part that is above ground should be tapered down to the ground to allow water to runoff. While the concrete is still wet, jam an anchor bolt down into the center until about ¾” of threading is sticking out. An anchor bolt is 1/2” in diameter and sort of like the letter “J”. Use one that is 8” or 10” long. They are available in a wider range of lengths, but most of the time this size will be adequate. Make sure the threading is reasonably vertical. The three anchor bolts must be aligned in the center of the concrete. 4x4 post anchor bases will be attached to these bolts and the posts attached to the bases. The concrete will dry in a couple of days depending on the weather but leave it alone for about a week (it will dry completely [called “cured”] in about a month). You can slip off the sonotube after two or three days. You can practice your logrolling technique after the inside of the tube dries. You’ll need two more temporary stakes and cross bracing attached to each post to keep them plumb until the rest of the substructure is installed. 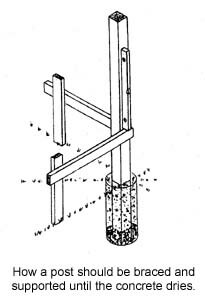 The two stakes and post will form a right angle. All three posts must be aligned. Stand at one end of your deck so you and the three posts are in a line. Look at the three posts before you. Looking from this perspective, you can easily tell if one or more posts are twisted even slightly. The top mount installation will allow you to adjust your post after the footing is cured. Embedding the posts requires a correction immediately. If you choose to embed the posts in the concrete, then dig down to the proper depth, fill the hole with 2” to 3” of pea gravel (stones 1/4” to 1/2” in diameter). Then set your post with the cross-bracing, and then pour in the concrete mix. Buy the 80# bag and add water (don’t let anyone sell you the “special” concrete water). Mix a bag at a time in a 3’0”x4’0” plastic tray (to the consistency of toothpaste or a little thicker). Use a cement hoe to mix the concrete and water quickly. The difference between this hoe and your average variety of hoe is that this hoe has two holes in it. Once your three posts are set, leave them alone for a week. Don’t touch them for the week. Testing to see if the concrete is hard will only create gaps between them and the surrounding concrete. This, in turn, allows water and bugs to get in and eventually destroy the wood. The three posts and the ledger board work together to support the entire structure. The ledger board is explained in the next section.